Catsparella: Hello Kitty Twilight Tees Show You Are on "Team Kitty"
Hello Kitty Twilight Tees Show You Are on "Team Kitty"
As far as I know, Hello Kitty doesn't appear in any of the movies, but that hasn't stopped Sanrio from cashing in on the Twilight craze. 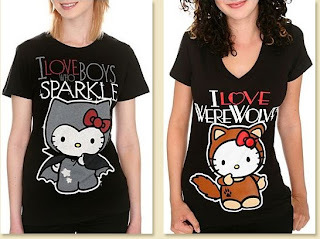 They've teamed up with Hot Topic for two t-shirts, designed to show you are on "Team Kitty." "I Love Boys Who Sparkle" features HK dressed as a vampire, complete with webbed cape, stars, and her omnipresent bow. "I Love Werewolves" has her suited up as the world's most adorable werewolf. Both tees are available for $22.00 - $24.00, exclusively at Hot Topic Online.